A view through the covered porch to the water. On the right, a glimpse of a trellis that will soon have greenery leading to the roof. The chimney is made of concrete blocks that have been covered with stucco, which was premixed with color before it was applied. The homeowners use this outdoor porch year-round. The stucco fireplace has a granite slab as a hearth. A view of the living room with its bamboo floors, high ceiling, and wall of windows. 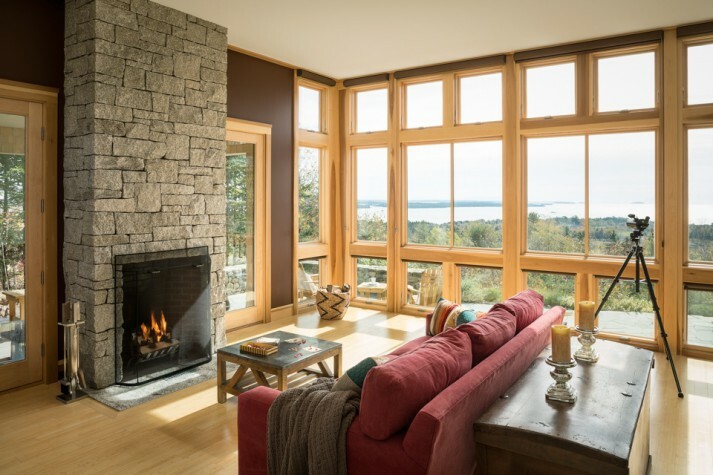 The double-sided fireplace is surrounded by granite on the interior and stucco on the exterior porch, which is seen through two glass doors framing the fireplace. An airy front entry features bamboo floors and an abundance of windows. 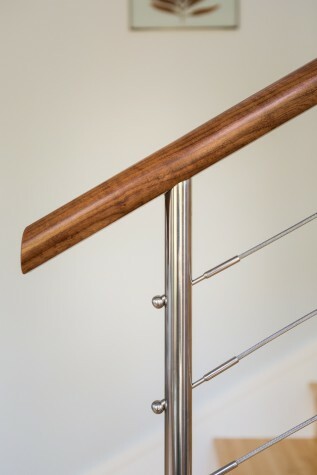 A detail of the front staircase with a cherry railing and stainless-steel post and cabling by Rockport Steel. The architects picked traditional cherry for the kitchen but chose a more modern flat-panel profile for the cabinets and industrial stainless steel for some of the drawers and all of the cabinet and drawer pulls. The homeowners’ bedroom, situated in a corner for views in several directions. 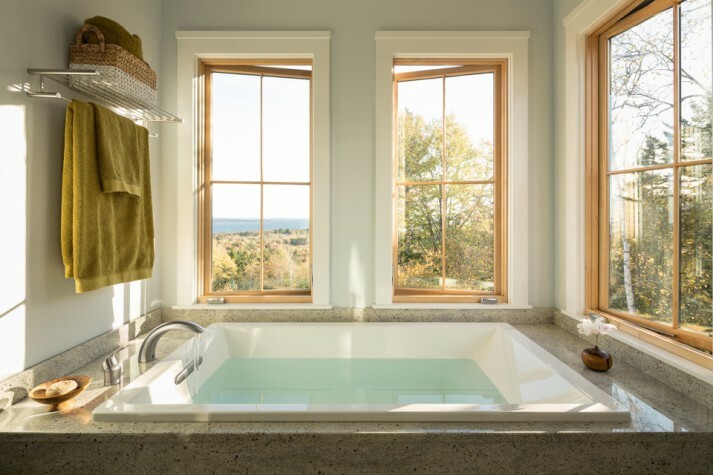 An oversized soaking tub with a granite surround and windows that allow the bather to enjoy the view. 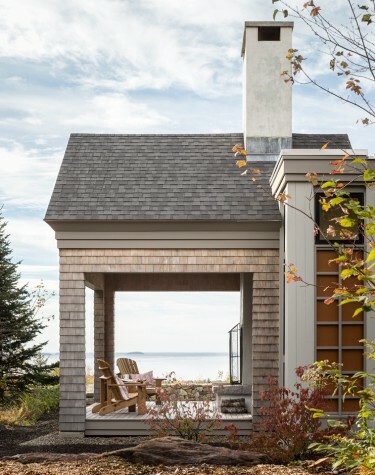 Marrying the traditional and contemporary, this house sits on a bluff above Penobscot Bay. The placement of the house, breezeway, and garage were dictated by the curving topography of the land. 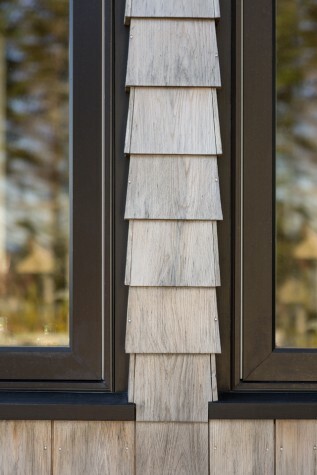 The white cedar shingles, asphalt roofs, columns, and gables are traditional, but interpreted with spare lines and orthogonal forms rather than the sweeping curves one might see in a shingle-style home. The cedar trellis on the orange-brown rectangle above the front entry is for vegetation that will soon connect with one of the green roofs planned for the front portico, living room, and breezeway. 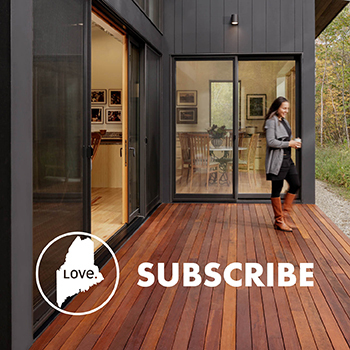 A couple builds a contemporary home that feels true to Maine. The Boston-based couple who own this Northport home trace their connection with Maine back to a yellow Labrador. Fourteen years ago, the couple’s summer plans involved finding a place to stay that took dogs. They learned of a canine-friendly inn in Belfast and drove up on a preposterously rainy day to start their vacation. In the morning, when they could actually see Penobscot Bay, they realized they’d landed in a truly beautiful place. From that summer on, the husband and wife vacationed in the Belfast area, renting a cottage in Searsport for 10 years. Eventually, they began to think they’d like to have their own house. In 2003 the husband found a piece of land on a promontory overlooking the bay. The views were tremendous, extending south down the coast to open water and east to Islesboro, North Haven, and Vinalhaven. The husband stood on the top of the property’s bluff and called his wife. “Trust me,” he said. “This is the place.” She did, and he put in an offer immediately. Although the land and its views were stunning, there was a complication. Namely, the level part of the four-acre property was actually very narrow, a flat spot on the side of a hill, between a steep slope on the downhill side and a rocky ledge on the uphill side. 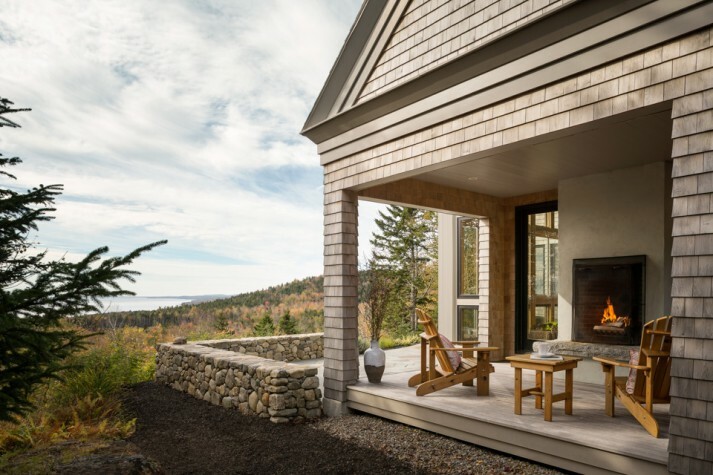 It would be almost five years before the couple would contact Bernhard and Priestley Architecture, then of Rockport, to begin a conversation about how to build. 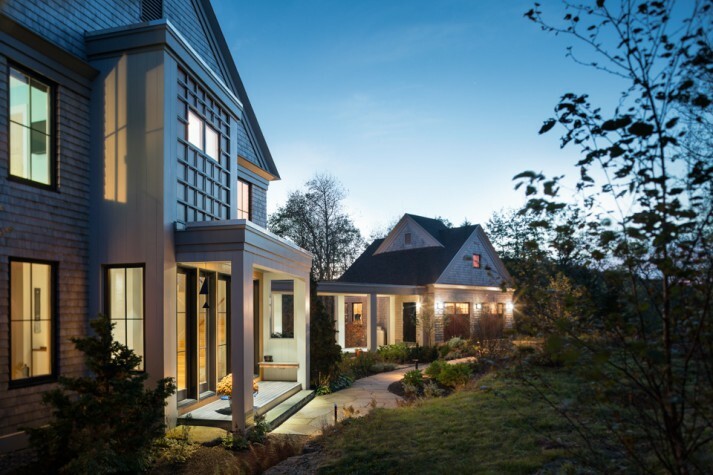 One most notices the traditional New England aspects of the house from the exterior, which has wide gables, white cedar shingling, asphalt roofs, and a bluestone terrace with a low fieldstone wall. But the sweeping curves of a traditional shingle house are absent here. The columns supporting the breezeway are orthogonal, and there is no casing or framing around the windows. 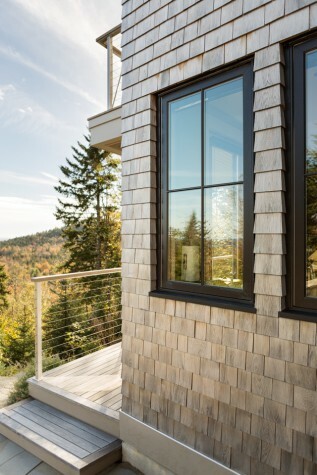 The shingles just turn the corners and meet the windows directly, so it looks “like you’ve carved holes in the shingle surface,” Priestley says. In addition, the trim at the eaves and rake is simplified, consisting of two flat boards rather than complicated molding. 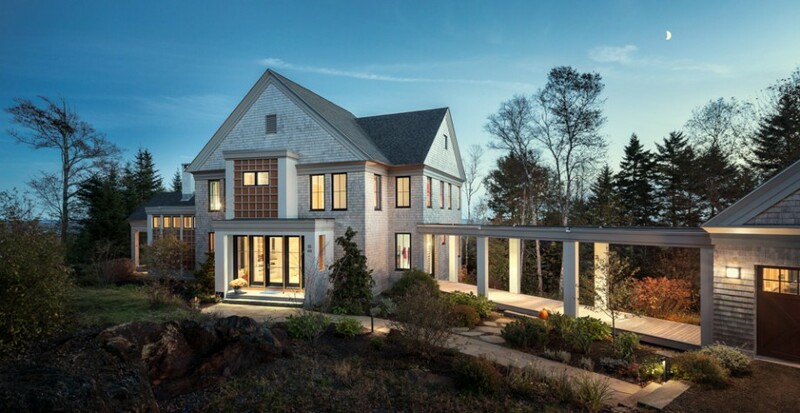 A cedar trellis above the portico, and another by the outdoor porch, both built over light orange-brown surfaces, will have vegetation that connects with the green roofs planned for the front portico, breezeway, and living room. 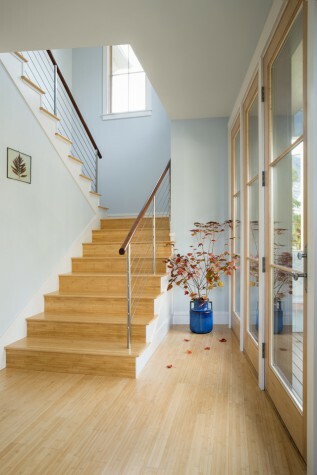 As soon as one steps inside, the contemporary bent of the house is apparent: the entry is a spare, minimal space with bamboo flooring and a light, elegant staircase with a cherry handrail, bamboo treads, stainless-steel posts, and cable railing. In contrast to the large great room that dominates so many contemporary homes, the spaces of the ground floor are distinctly defined, though there are low partitions and cutouts in the walls so that one can look from one space to another. The house reveals itself in increments. From the front entry one can look left and see over a partition with built-in bookshelves and through the colorful dining room to the living room, with its own bold colors and granite fireplace. The primary hallway, though, leads straight ahead, past maple closet doors to the substantial kitchen, which is central to the home, as cooking and entertaining are favorite activities of the couple. “We almost always have friends here with us,” the husband says. The layout—with stools at a two-level island made of a “celestial blue” Zodiaq quartz surface—“[allows] our friends to hang with us over cocktails and snacks while we cook,” says the wife. The kitchen also affords guests a superb view of the bay and an easy transition from kitchen to dining room when the meal is prepared. 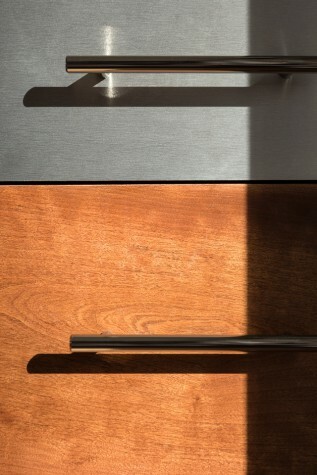 The kitchen cabinetry is cherry with stainless-steel pulls. The cherry is a nod to the traditional, Priestley observes, but the flat panels of the cabinets, the pulls, and a band of stainless-steel drawers below the gray granite countertops suggest the industrial. Because the couple wanted to maximize storage space, there are even drawers at floor level, where the kick space is located. Another unusual feature: the countertops are built two inches higher than customary, since both husband and wife are tall. The couple like bold colors, evinced in the blue of their kitchen island, and also in a chocolate brown accent wall in the dining room, a bright orange powder room, a red office, and the purple accent wall in the owners’ bedroom. Glass abounds in the house. The high-ceilinged living room has a south-facing wall of glass that wraps around a corner to a tall door that leads to the terrace. (The height emphasizes that this room is “the big event,” says Priestley.) The north side of the room has a wall of built-in bookcases with clerestory windows above, letting light in from that side of the room while preventing glare and minimizing heat loss through fenestration on the north side of the passive solar house. Still, wherever there was a chance to put windows on more than one wall in the home, the architects did so, with windows that wrap the corners in the owners’ bedroom, downstairs office, and owners’ bathroom, as well as three large windows that light up the staircase, adding to the sense of transparency that is an important part of the overall vision. In this vein, where a traditional house might have many-paned windows, this house has two-over-two panes with slim window sashes and no trim, all of which emphasize the lightness of the house. Despite its elegance, the house has many practical features that suit the homeowners’ particular lifestyle. The couple had originally described themselves to their architects as “two plus dogs,” so the daily entrance into the house isn’t through the front door but from the garage, across a breezeway, and to a tiled room with a utility sink and freestanding freezer. A small exercise room is placed off the owners’ bedroom. An oversized shower room has a high ceiling, again to suit the couple’s heights, and the owners’ bathtub (which is porcelain with a granite surround) and bedroom are placed so the views can be appreciated while reclining. The couple would never have thought of having a covered porch with a fireplace until they saw such a feature in a magazine. Now they use their covered porch year-round. They make s’mores every night in the summer and even have a kitchen drawer devoted to marshmallows and graham crackers. Project manager Keith Maguire, formerly of Oliver Builders in Lincolnville, says the project was a difficult one because of all the blasting necessary to site the house. “We had to blast to get in the water line from the well and to get the septic out. Everything from the foundation to the utilities we had to blast for,” he says. Plus, the working environment was harsh, with the project beginning in the fall, when weather was coming out of the northwest onto the hill. “It was pretty intense for the guys,” Maguire says, referring to the subcontractors he gathered for the project. What all that translated into, however, is a place of great peace and simplicity. 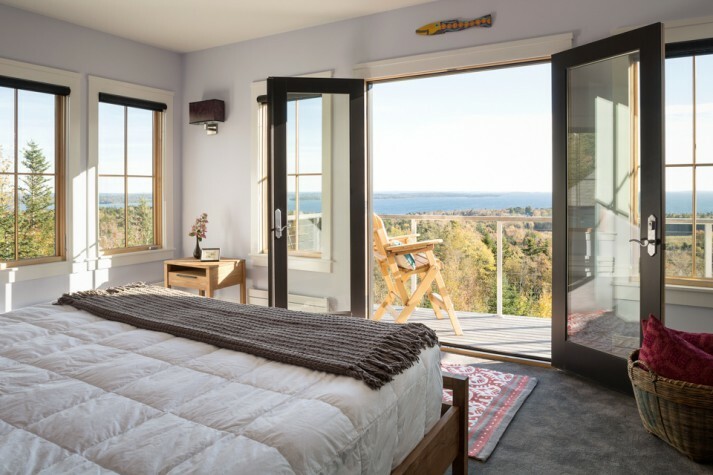 Even with an office in one corner, the Northport home is clearly a place to relax, and to relax while looking at the view. The couple has a friend who says the house has a happy vibe. He likes to visit and sit in a deck chair for hours and just look at the water. And who can blame him? Everything about the house—its orientation, windows, outdoor balcony, and terrace—suggests that looking at the water is the perfect thing to do.